Does ordering take-out sound more appealing than cooking a large meal? Would you rather sit back and relax with a cocktail and lively conversation than worry about your roast burning right before your guests arrive? There are still plenty of reasons to invest in your kitchen even if you do not cook. Your kitchen doesn’t need to resemble that of a world class chef to remain as the hub of activity, entertaining, and family life. Keeping your appliances to a minimum allows you for more space to include the things you will actually use, like a wine cooler or an extra-large seating area. For the avid coffee drinker, our last post discussed coffee stations. Whether you need just a space for your Keurig or a whole countertop for your espresso machine, read that post to get some ideas for your morning fix. When designing a kitchen to fit your lifestyle, consider which appliances you actually use every day. Do you really need that professional grade range that looks great in the design magazine or do you actually find yourself never using more than one burner at a time? Cutting down on the size or number of appliances is a great way to save money and space for the things that you really want. 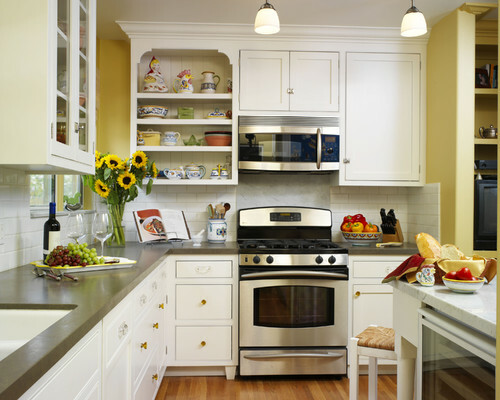 However, be mindful of the resale value of your kitchen and don’t get too carried away when minimizing your appliances. While you may be able to get by with only a couple of refrigerated drawers, the lack of a proper refrigerator may turn away many potential buyers. 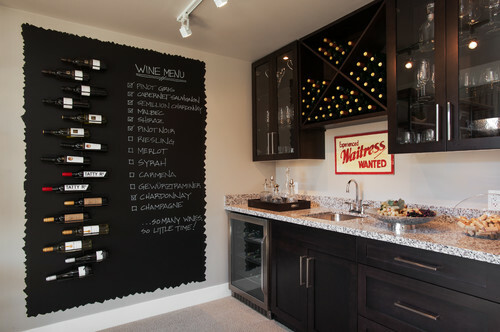 Create a lively gathering place for the adults with a wet bar. Instead of the newly popular double oven, get a traditional stove/oven combination and use the extra space to install a wine fridge to showcase your impressive collection. Display your barware behind glass cabinet doors and your carefully crafted cheese plate on the coordinating countertops. For daily family life, forego a sink or cooktop in the ever popular island. Instead, focus on making it a casual dining area or homework station with cabinets for supplies. Expand your home’s nerve-center with a space for the children to study and mom or dad to coordinate the weekend‘s soccer games and play groups. Try using shelving instead of cabinetry. The openness of the shelving allows you to display your collection of eclectic treasures or creative cocktail recipe books. Without the enclosure of a standard cabinet, the shelves can add height and light to the space. If you are looking to adapt your kitchen without a big remodeling project or are concerned about the resale value of a kitchen without traditional upper cabinets, simply take the doors off of your existing cabinets. This allows you to take a test drive before committing to this innovative method of kitchen storage. Consider painting the backs of these door-less cabinets a bright color to add a pop of fun. Downsize your traditional kitchen table to a small one for two and use the rest of the space for bench seating or a comfortable sofa. Use the space as an extension of your living room in your open floor plan or as a quiet retreat when the rowdy sports fans have taken over. If you are looking for more ideas on how to create a kitchen that reflects your lifestyle but still maintains functionality and resale value, talk with any of our talented Kitchen Views designers. Do you have more thoughts on how to make a kitchen adapt for the non-cook lifestyle? Share your ideas in the comments.